Cocoa closed on March 31, 2015 at $2699 per ton, which was down over 7.25% for the first quarter of the year. On Friday, May 15, active month July cocoa futures settled at $3133 – an increase of 16% in just six weeks. Many commodity prices have rebounded over recent weeks, due primarily to an almost 7% dip in the value of the U.S. dollar. As the world’s reserve currency, the dollar is the pricing mechanism for most commodities. However, the move in cocoa has its roots in the fundamental structure of the market for cocoa beans itself. 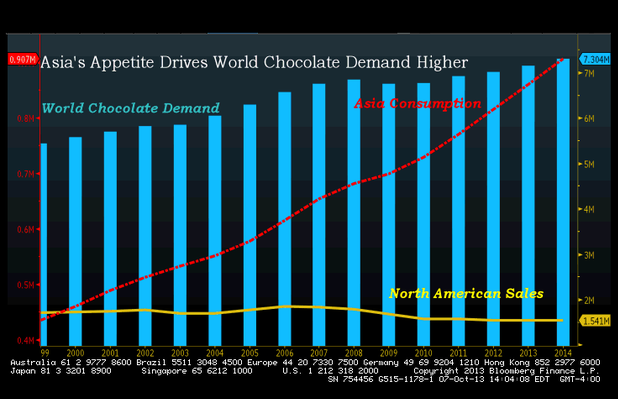 One of the major reasons that cocoa prices have moved higher is that demand for chocolate confectionary products in Asia has exploded over the years. 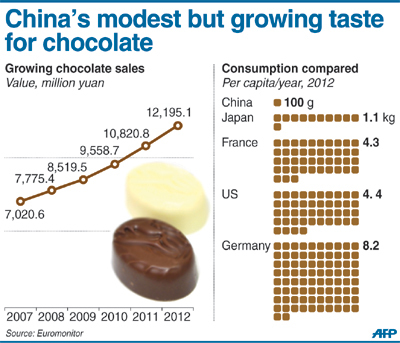 As the chart illustrates, world chocolate demand has been rising because more people in Asia are discovering the delicious treat. While Asia has traditionally survived on a rice-based diet, growing wealth has resulted in a more complex diet, which obviously includes desserts and tasty treats. As a fellow chocoholic, I truly understand the growing addiction for chocolate; once someone tries the delicious taste, the desire to incorporate it into daily diet is understandable. 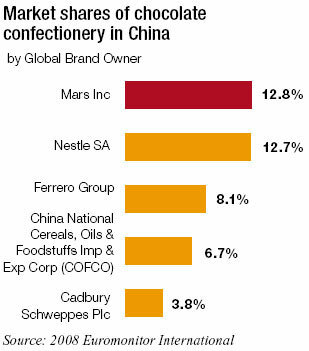 The populations in countries like China and India turning on to cocoa products is a staggering thought. These two nations comprise over 35% of the world’s population, or over 2.95 billion potential chocolate consumers. This means that demand for cocoa beans will continue to rise in years to come. Since the end of the first quarter of 2015, the price of cocoa has reflected the long-term demand trend for the commodity. 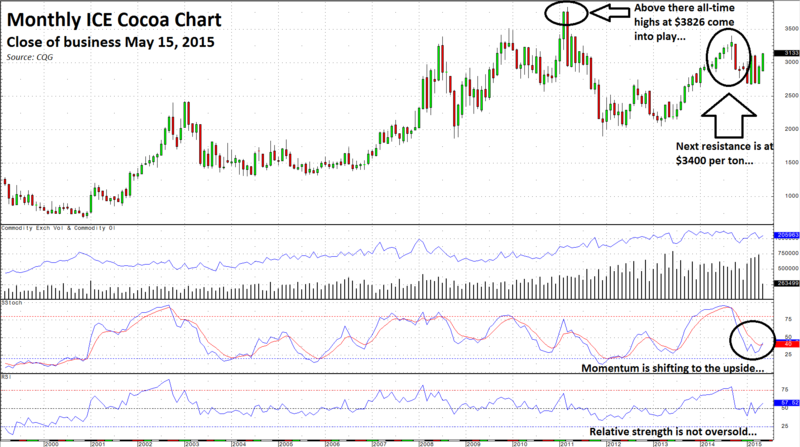 Recently, cocoa broke above the March 3, 2015 highs of $3023, and it now appears headed for the next level of medium-term resistance on the July futures contract chart at $3301, the September 25, 2014 highs for that specific futures contract. A rising price and rising open interest, the number of open long and short positions on ICE cocoa futures, is often a bullish technical signal for a commodity. 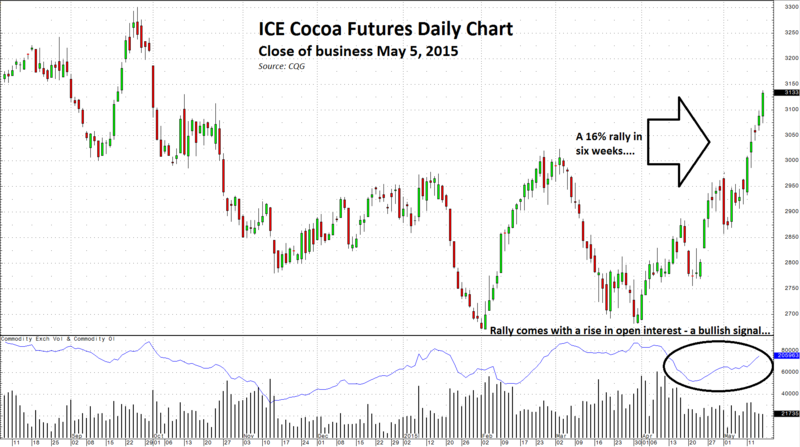 While the daily chart for cocoa futures is bullish, the long-term chart is even more positive. The next target is $3400 and then the moon. The monthly chart of ICE cocoa futures now seems poised for an attack on resistance at $3400, the September 2014 continuous contract high. The trajectory of cocoa is higher on both a technical and fundamental basis. Technically, the next level of resistance in ICE cocoa futures is at the $3400 per ton level. Above there, all-time highs of $3826 come into play. The slow stochastic, a momentum indicator, has crossed and is turning higher on the long-term monthly chart. Additionally, the relative strength index at 57 is still in neutral territory. The RSI is not indicating an overbought condition from a long-term point of view. Demand-based rallies tend to move slower than supply-side rallies. In cocoa, price action since the lows in 2011 at $1898 has been slow and steady with periods of consolidation and sell-offs. The majority of cocoa production in the world comes from two countries, the Ivory Coast and Ghana. These two African nations have the right climate to grow the beans that are required to make chocolate. Over 60% of the world’s production of cocoa beans comes from these two countries. Given their location, stability, and logistics in the region, it is always possible that an issue could arise with the cocoa crop. Nothing gets the price of an agricultural commodity moving higher than a shock to the supply side of the fundamental equation. In coming months, cocoa crops could become a victim of a weather event, the El Nino developing in Australia and Japan. This event could warm the waters of the Pacific Ocean and lead to a shift in global weather patterns, including lower rainfall in Western Africa, home to the Ivory Coast and Ghana. 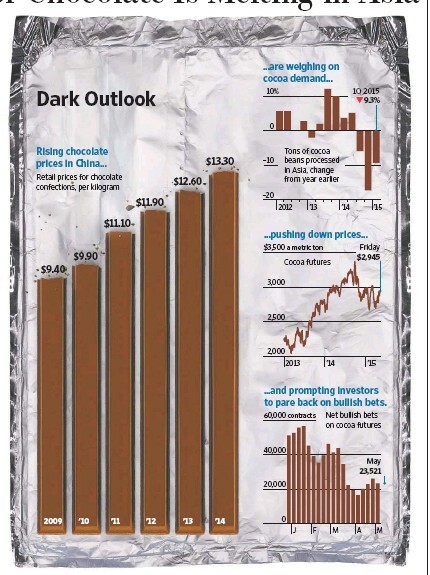 “If the effects of El Nino touch West Africa we could easily get 2,500 pounds ($3,925 per ton) because the major origins are well sold and there is room for incremental speculative buying,” according to Derek Chambers, head of cocoa trading at Sucres et Denrees (Sucden). I worked with Chambers in the late 1980s and early 1990s at Philipp Brothers where he ran the worldwide cocoa business. Chambers is a huge and influential trader in the global cocoa business. While the International Cocoa Organization (ICCO) forecasts total 2014/2015 world cocoa production at 4.232 million tons, Sucden and Chambers have already traded between 220,000 and 250,000 tons – almost 6% of total global output. Sucden forecasts a global deficit in the area of 104,000 tons for 2015/2016, but the deficit is likely to widen if El Nino strikes, according to Chambers. Moreover, the cocoa futures market has been tightening of late with term structure moving into backwardation. Backwardation is a condition whereby nearby prices are higher than deferred prices. As of the close of business on Friday, May 15, the forward curve in ICE cocoa futures was in a progressive backwardation, indicating fears of a supply shortage or market deficit. This condition is traditionally a bullish signal for a commodity. The bottom line is that increasing demand has been supporting the cocoa price for the past few years; a supply issue could turbo charge a move higher. I continue to believe that cocoa is in an excellent position to make new all-time highs. There are a few ways to position for higher cocoa prices. There are futures contracts and options offered in the U.S. on the Intercontinental Exchange (NYSE:ICE), as well as contracts, and options offered in the London market. There are also ETN products in cocoa. The iPath Bloomberg Cocoa Sub TR ETN (NYSEARCA:NIB) has net assets of around $17.6 million and trades an average daily volume of around 9,100 shares per day. The iPath Pure Beta Cocoa ETN (NYSEARCA:CHOC) has net assets of around $6.13 million and trades an average daily volume of around 1,300 shares each day. While each of these products is not overly liquid, they do offer the opportunity to position in the cocoa market without participating in volatile futures markets. NIB offers options on the ETN, while CHOC does not. Cocoa seems to be preparing for a move higher; the stars are lining up in terms of the technical picture as well as the fundamentals. Rising Asian demand has been supporting the price for a while now, but the prospects for a supply-side issue could accelerate a rally and challenge all-time highs in the near future. Chocolate lovers of the world unite; cocoa seems to have a sweet future ahead and the recent rally may only be the start of a much larger move.